He was named as male World Sailor of the Year at the ISAF World Sailor of the Year Awards in 2017. He and his 49er partner Blair Tuke also won the award in 2015, and were finalists in 2014 and 2016. Burling won four consecutive 49er World Championships, two 420 class World Championships and the 2015 Moth World Championships. Burling sailed as watch captain and helmsman with Team Brunel on the Round-the-World 2017–18 Volvo Ocean Race finishing 3rd overall in the closest finish in the history of the race, with the top 3 boats going into the final leg effectively tied on points and finishing just 25 minutes apart. Team Brunel won 3 of the final 5 legs, including the leg from Auckland to Brazil, which the organisers say was the hardest leg in the history of the race. Burling was born in 1991 in Tauranga. His education began at Welcome Bay School and Tauranga Intermediate School. Burling started sailing at the age of six in the Welcome Bay estuary near his home in Tauranga, in an old wooden Optimist called Jellytip. At the age of eight, he joined Tauranga Yacht Club and started competing. Burling attended high school at Tauranga Boys' College, also attended at the time by cricketer Kane Williamson. He studied Mechanical Engineering at the University of Auckland where he completed half of the 4 year degree. Burling sailed in his first Optimist nationals at age 9. At the age of 11 in 2002, Burling finished 2nd in the New Zealand Optimist Nationals (under-16). He competed in the 2002 Optimist World Championships in Texas at the age of 11. In 2003 at the age of 12, Burling won the New Zealand Optimist Nationals and competed in the 2003 Optimist Worlds in the Canary Islands where he finished 40th. He stopped sailing the optimist at age 12. At age 13, he was 2nd in the New Zealand P class Nationals (under 17). He won the NZ Starling nationals (under 19) – (winning both the Fleet racing and Matchracing titles) twice – at age 14 and 15. At the age of fifteen Burling (with Carl Evans) won the 2006 420 Class Worlds in the Canary Islands – the youngest sailors ever to do so. They also won the under-16 and under-18 world championships. At 16 years old Burling successfully defended his 420 title to win the 420 Class Worlds sailed in Auckland. He also won the under-18 world championship. Burling finished 6th in the 2007 470 Europeans – his first international 470 regatta and had his best world ranking in the 470 of 5th in 2008. Burling was the helmsman for Emirates Team New Zealand's 2017 America's Cup campaign, which was raced in Bermuda. On 27 June 2017, he became the youngest winning helmsman in the history of the Americas Cup, when at age 26 he and his team won the 35th competition for the cup. Burling skippered the New Zealand Sailing Team entry to victory in the inaugural Red Bull Youth America's Cup in San Francisco in September 2013. Burling helmed for Team Korea's White Tiger Challenge, in the 2011–13 America's Cup World Series in San Francisco in 2012. Burling with Blair Tuke were Olympic flag bearers for New Zealand at the 2016 Olympics. They were just the 4th New Zealand flagbearers to win a gold medal at the same Olympics. At age 25, Burling was the youngest ever 49er Olympic gold medal skipper. He and Tuke won the 2016 Olympics with two races to spare and by an overall 43 point margin – winning by the most points of any sailing class in the Olympics in over 50 years. At the 2012 London Olympics, Burling (then aged 21) was the youngest 49er sailor. He won the silver medal as helm in the 49er class alongside Blair Tuke.His silver medal was, jointly, New Zealand's 100th Olympic medal. Burling and Tuke are the first sailors to win four consecutive 49er class World Championships (2013, 2014, 2015 and 2016). They won all 28 of the major regattas in the 49er between the London Olympics (2012) and the Rio Olympics (2016). The only regatta they did not win in this time was when they finished 3rd in a short 2 day regatta prior to the Olympics. In all the major regattas (Olympics, Worlds, Europeans, World Cup) in 2015 and 2016 they led into the medal races by over 20 points – effectively winning the regattas before the medal race. Burling finished 11th in the 470 class at the 2008 Olympics. At 17 years old (still at school), he was the youngest sailor ever to represent New Zealand at the Olympic Games. Burling was the youngest sailing competitor at the 2008 Olympics and the youngest member of the 2008 New Zealand Olympic team. 2017–2018 3rd Volvo Ocean race sailing on Team Brunel. Burling was the 2015 International Moth World Champion. He was 2nd in the 2017 Moth Worlds. Burling finished 3rd in the 2014 A class catamaran Worlds. In November 2015, the International Sailing Federation announced that Burling and Tuke were the ISAF Rolex World male sailors of the year. Member of the New Zealand Order of Merit for services to sailing, 2017 New Year Honours. Finalist, Rolex World Sailor of the Year 2014, 2015, 2016 (with Blair Tuke), 2017. Finalist Halberg awards (New Zealand), Team of the Year (with Blair Tuke) 2012, 2013, 2014, 2015, 2016. 2015 – Moth World Champion – Sorrento, Australia. 2007 – 420 Open World Champion, age 16. 2006 – 420 Open World Champion, age 15. 116th – 2002 – Optimist World Championships – Texas (age 11). 2013, 2014, 2015 and 2016 Unbeaten in major 49er regattas worldwide (27 49er regatta victories since London Olympics). 2013 Skipper of the winning boat in the Red Bull Youth America's Cup. 1st Swan River Match Cup (Perth) – helm, sailing with Blair Tuke, Glenn Ashby, Josh Junior. 3rd overall in 2015–2016 America's Cup World Series. Helm for Emirates Team New Zealand – overall leader of 2015 America's Cup World Series. ^ a b c "49er Olympic results 2016". sailing.org. sailing.org. Retrieved 27 August 2016. ^ "New Zealand win 49er Gold, Australia silver, Germany bronze". Sailing.org. World Sailing. Retrieved 22 August 2016. ^ Johannsen, Dana. "Sailor of the year: Master of the understatement". NZ Herald. NZ Herald. Retrieved 10 November 2017. ^ "Dongfeng Race Team win the Volvo Ocean Race with late pass on final day". Volvooceanrace.com. Volvooceanrace.com. Retrieved 1 July 2018. ^ "Team Brunel hold on to win toughest stage of Volvo Ocean Race". volvooceanrace.com. Volvo Ocean race. Retrieved 3 April 2018. ^ Dana, Johannsen. "America's Cup: 'It's his baby, that boat". NZ Herald. Retrieved 5 August 2017. ^ McFadden, Suzanne. "Team New Zealand's Burling in a class of his own". newsroom. newsroom. Retrieved 5 August 2017. ^ Gladwell, Ben. "Who is Peter Burling?". Stuff.co.nz. Fairfax. Retrieved 30 April 2015. ^ Geenty, Mark. "Peter Burling always beat the bigger kids, but he's never faced bigger than Jimmy Spithill". Stuff.co.nz. Fairfax. Retrieved 16 June 2017. ^ White, Peter. "Former Tauranga Boys' College classmates Williamson and Burling lead by example". BOP times. Bay of Plenty times. Retrieved 5 August 2017. ^ "2002 NZL optimist nationals results" (PDF). Retrieved 2 April 2002. ^ "2003 Optimist Worlds results" (PDF). ^ "Bay sailors bag Starling double". BOP times. Retrieved 10 January 2005. ^ "Burling wins Starling Double for second year". Retrieved 8 January 2006. ^ "Yachting: NZ teens take yachting's 420 class world title". NZ Herald. Retrieved 7 August 2006. ^ "Peter Burling's Kiwi crew is the class act of the Red Bull Youth America's Cup". Archived from the original on 9 September 2013. Retrieved 4 September 2014. ^ "NZL crowned Youth Americas Cup Champions". Retrieved 5 September 2012. ^ "Yachting: Burling keeps getting better". NZ Herald. Retrieved 21 September 2012. ^ "Burling and Tuke named Olympic Team Co-Captains". nzoc. NZOC. Retrieved 6 August 2016. ^ Johnstone, Duncan. "Rio Olympics 2016: NZ sailors Peter Burling, Blair Tuke claim gold in 49er class". Stuff.co.nz. Stuff.co.nz. Retrieved 17 August 2016. ^ "Peter Burling and Blair Tuke wrap up gold medal with two races to spare". newshub. newshub. Retrieved 20 September 2016. ^ "Encyclopedia of the games". Encyclopedia of the games. Retrieved 10 November 2016. ^ "Yachties win NZ's 100th Olympic meda". stuff.co.nz. Archived from the original on 9 August 2012. Retrieved 9 August 2012. ^ "Olympics: Sailors win NZ's 100th Olympic medal". The New Zealand Herald. Retrieved 9 August 2012. ^ "Peter Burling and Blair Tuke win third world 49er yachting title". stuff.co.nz. stuff. Retrieved 22 November 2015. ^ "BURLING AND TUKE MAKE IT 25 IN A ROW WITH 2016 49ER EUROPEAN CROWN". Yachting NZ. Yachting NZ. Retrieved 16 April 2016. ^ "Age of little concern to baby of Olympic team". 3 News. Retrieved 9 August 2012. ^ "Yachting: The confident course of youth". NZ Herald. Retrieved 1 August 2008. ^ "Peter Burling Olympian 1006". NZ Olympic Museum. Olympic.org.nz. Retrieved 4 October 2015. ^ "Burling wins Moth World Title". Retrieved 3 February 2015. ^ Johannsen, Dana. "Top international gong for Burling and Tuke". The New Zealand Herald. Retrieved 10 November 2015. ^ "Peter Burling and Blair Tuke named ISAF Rolex World Sailors of the Year". Sailing.org. World Sailing. Retrieved 10 November 2015. ^ "New Year Honours List 2017". Department of the Prime Minister and Cabinet. 31 December 2016. Retrieved 31 December 2016. ^ "Bouwmeester and Burling the big winners at inaugural World Sailing Awards". World Sailing. World Sailing. Retrieved 10 November 2017. ^ "Burling and Tuke take ISAF World Sailor of the Year for 2015 Honours". Olympic.org.nz. NZ olympic. Retrieved 30 July 2017. ^ "2014 ISAF World Sailor nominee Peter Burling & Blair Tuke". Archived from the original on 3 February 2015. Retrieved 3 February 2015. ^ "A Golden List, 2016 Rolex World Sailor of the Year Nominees Announced". sailing.org. World Sailing. Retrieved 5 October 2016. ^ "2017 Rolex World Sailor of the Year nominees". World Sailing. Retrieved 22 September 2017. ^ "Burling and Tuke named 2013 House of Travel Sailor of the Year". Yachting NZ. Yachting NZ. Retrieved 30 November 2013. ^ "Burling and Tuke named for New Zealand Sailing's Top Honour for 2014". Yachting NZ. Yachting NZ. Retrieved 29 November 2014. ^ Bakewell-White, Jodie. "BURLING AND TUKE MAKE HISTORY WITH NEW ZEALAND SAILING'S TOP HONOUR". Yachting NZ. Yachting NZ. Retrieved 28 November 2015. ^ "In a league of their own;Peter Burling and Blair Take claim yachting's top award once more". Yachting NZ. Yachting NZ. Retrieved 26 November 2016. 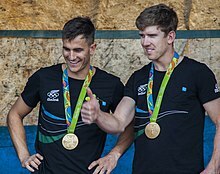 ^ "BURLING AND TUKE NAMED TEAM OF THE YEAR AT HALBERG AWARDS". Yachting NZ. Retrieved 13 February 2017. ^ "50th Westpac Halberg Awards Finalists Announced". Archived from the original on 13 February 2013. Retrieved 20 February 2013. ^ "51st Westpac Halberg Awards Finalists". Archived from the original on 5 January 2014. Retrieved 15 February 2014. ^ "Halberg Awards: Finalists announced". NZ Herald. Retrieved 1 February 2015. ^ "Finalists announced for Halberg Awards". NZ Herald. Retrieved 7 January 2016. ^ "Golden glow of Rio dominates finalists list". stuf.co.nz. stuff. Retrieved 11 January 2017. ^ "Burling and Tuke wrap up Kiwi 49er gold with the Medal Race to spare". World Sailing. Retrieved 16 August 2016. ^ Woodcock, Fred. "Peter Burling looms as sailing's next star". Stuff.co.nz. Retrieved 9 August 2008. ^ "470 Men – Olympic Games Qingdao – China" (PDF). Retrieved 1 September 2008. ^ Bakewell-White, Jodie. "BURLING AND TUKE SECURE 4TH CONSECUTIVE 49ER WORLD CHAMPS IN IMPRESSIVE STYLE". Yachting NZ. Yachting NZ. Retrieved 15 February 2016. ^ Rice, Andy. "FIRST FX TITLE FOR SPAIN, FOURTH FOR THE KILLER KIWIS". 49er.org. 49er.org. Archived from the original on 18 February 2016. Retrieved 15 February 2016. ^ a b "2015 49er Worlds results". 2015 49er Worlds results. 49er.org. Retrieved 21 November 2015. ^ Bakewell-White, Jodie. "BURLING AND TUKE WIN 49ER WORLD CHAMPS FOR THREE IN A ROW". Yachting NZ. Yachting NZ. Retrieved 22 November 2015. ^ "2015 International Moth Worlds results". Archived from the original on 5 February 2015. Retrieved 5 February 2015. ^ "Titans of the sport to compete at 2015 Moth Worlds". Retrieved 4 December 2014. ^ a b "2014 49er World Championship results". Retrieved 21 September 2014. ^ "2013 49er Worlds results" (PDF). Retrieved 1 July 2013. ^ "Teen stars lead NZ clean-sweep". Retrieved 10 January 2007. ^ "420 World Champ". Retrieved 7 August 2006. ^ a b "Moth Worlds 2017 results". Moth Worlds. Retrieved 30 July 2017. ^ "2012 49er Worlds results" (PDF). Retrieved 13 May 2012. ^ "2011 49 World Champs results" (PDF). Retrieved 20 December 2012. ^ "THEIR PERFECT YEAR – SAILING SUPERSTARS BLAIR TUKE AND PETER BURLING". High performance Sport NZ. Retrieved 15 February 2015. ^ "BURLING TAKES WMRT SWAN RIVER MATCH CUP TITLE AND FLIES". World match racing tour. WMRT. Retrieved 26 January 2017. ^ "Olympic results". World sailing. World sailing. Retrieved 27 August 2016. ^ "49er results Rio yacht club". Rio yacht club. Rio yacht club. Retrieved 27 August 2016. ^ "Kiel week 49er results". Kiel week 49er results. Kierer Woche. Retrieved 26 June 2016. ^ "Unbeatable? 49er World Champs Burling and Tuke clinch Kieler Woche title with day to spare". Kieler Woche. Kieler Woche. Retrieved 26 June 2016. ^ "Game over in the 49er, 26 in a row for Burling and Tuke". Sailing.org. World Sailing. Retrieved 30 April 2016. ^ "Sailing World Cup Hyeres 49er results". Sailing.org. World Sailing. Retrieved 30 April 2016. ^ Remocker, Ben. "Burling and Tuke Secure Fourth Straight European Title Prior to the Medal Race". 49er.org. 49-er.org. Retrieved 16 April 2016. ^ "2016 49er European Results". 49er.org. 49er.org. Retrieved 16 April 2016. ^ Johannsen, Dana. "Yachting: Burling and Tuke win another world title". NZ Herald. NZ Herald. Retrieved 15 February 2016. ^ "49er 2016 Worlds results". 49er.org. 49er Assn. Retrieved 15 February 2016. ^ "CLOSE RACING AT 2016 49ER AND FX CHAMPS". Yachting NZ. Yachting NZ. Retrieved 11 January 2016. ^ a b "EMIRATES TEAM NZ FINISHES THIRD OVERALL IN THE LOUIS VUITTON AMERICA'S CUP WORLD SERIES". Emirates Team NZ. ETNZ. Retrieved 21 November 2016. ^ "EMIRATES TEAM NZ REMAIN ON TOP AFTER OMAN". ETNZ. ETNZ. Retrieved 28 February 2016. ^ "EMIRATES TEAM NZ EXTEND LEAD AFTER LVACWS CHICAGO". ETNZ. Retrieved 13 June 2016. ^ "GOOD AND BAD TO TAKE AWAY FROM TOULON TOWARD JAPAN". ENNZ. ETNZ. Retrieved 15 September 2016. ^ "49er 2015 South American Championship". 49er.org. 49er.org. Retrieved 9 November 2015. ^ "Olympic test event results". ISAF. Retrieved 21 August 2015. ^ "Four Rio Podiums Decided on Penultimate Day". ISAF. Archived from the original on 24 August 2015. Retrieved 21 August 2015. ^ "Rio International Sailing week 49er Results". 28ª Semana Internaciona de Vela do Iate Clube do Rio de Janeiro. Rio yacht club. Archived from the original on 10 August 2015. Retrieved 6 August 2015. ^ "Burling and Tuke bounce back from disqualification to win the Europeans". 49er.org. 49er.org. Retrieved 13 July 2015. ^ Remocker, Ben. "Will this be the day Tuke and Burling get Beaten". 49er.org. 49er.org. Retrieved 13 July 2015. ^ "2015 49er Europeans Results" (PDF). 49er.org. Retrieved 13 July 2015. ^ "Burling and Tuke Dominate Final Day to Lock Up 17th Straight Victory". 49er.org. 49er.org. Archived from the original on 16 June 2015. Retrieved 16 June 2015. ^ "Weymouth world cup 49er results". ISAF. Retrieved 16 June 2015. ^ Remocker, Ben. "Big Moves Shift Fleet to Set Up Final Day Live Broadcast". 49er.org. 49er.org. Archived from the original on 8 May 2015. Retrieved 25 May 2015. ^ "SWC HYÈRES – MEET PETER BURLING & BLAIR TUKE". Sailing.org. ISAF. Retrieved 3 May 2015. ^ "49er Results Sailing world cup Hyeres". ISAF. Retrieved 3 May 2015. ^ "49er Class". Sail Auckland 49er results. Sail Auckland. Retrieved 5 April 2015. ^ "Sail Auckland 2015 49er results". rayc.co.nz. RAYC. Retrieved 1 March 2015. ^ "49er NZL Nationals". Yachting NZ. Retrieved 5 April 2015. ^ "EMIRATES TEAM NZ EXTEND THEIR WORLD SERIES LEAD IN BERMUDA". emirates-team-new-zealand. Emirates Team NZ. Retrieved 19 October 2015. ^ "DEBUT DAY IN PORTSMOUTH". emirates-team-new-zealand.americascup.com. ETNZ. Retrieved 25 July 2015. ^ "2014 49er Intergalactic Results". Retrieved 14 November 2014. ^ "2014 49er Sth American results" (PDF). Retrieved 8 November 2014. ^ "Aquece Rio 49er results" (PDF). 49er.org. Retrieved 8 August 2014. ^ "2014 49er Europeans results" (PDF). Retrieved 13 July 2014. ^ "NZ reclaims European Crown". Retrieved 13 July 2014. ^ "2014 Hyeres 49er results". ISAF. Retrieved 26 April 2014. ^ "2014 Mallorca world cup 49er results". ISAF. Retrieved 5 April 2014. ^ "Sailing: Burling completes first regatta with Team NZ". NZ Herald. Retrieved 5 May 2014. ^ "Yachting: Burling is A Class above". NZ Herald. Retrieved 9 February 2014. ^ "Taste of things to come?". Daily Sail. Archived from the original on 9 September 2013. Retrieved 4 September 2013. ^ "NZL SAILING TEAM WITH ETNZ ARE CROWNED RED BULL YOUTH AMERICA'S CUP CHAMPIONS". Yachting NZ. Retrieved 5 September 2013. ^ "Gold to NZ in 49er". Retrieved 7 July 2013. ^ "2013 Aus Moth nationals results". Retrieved 12 January 2013. ^ "49er sails 120nm Coastal Classic". Sail-world. Retrieved 1 February 2010. ^ "Coastal Classic in a 49er skiff". sunlive. Retrieved 27 October 2009. ^ "National Youth Match-Racing title to Burling brothers and Blair Tuke". Sail-World. Retrieved 1 May 2010. ^ "Bay yachtie rattles Barker". BOP times. Retrieved 18 November 2008. ^ "420 JR EUROPEAN CHAMPIONSHIP-FINAL SERIES 2006" (PDF). 420 sailing. Retrieved 19 August 2006.